External stowage platforms (ESPs) are key components of the International Space Station (ISS). Each platform is made from steel and serves as an external pallet that can hold spare parts, also known as orbital replacement units (ORUs), for the space station. As a platform it is not pressurized, but does require electricity to power the heaters of some of the stored equipment. ORUs are attached to the ESP via Flight Releasable Attachment Mechanisms (FRAMs), matching witness plates that mate the ORU to the platform. While ESP-1 is unique in shape, ESP-2 and ESP-3 were based on the deployable version of the Integrated Cargo Carriers (ICC), which were designed to transport unpressurized cargo inside the Space Shuttle's cargo bay. ESP-1 was transported to the International Space Station on STS-102, ESP-2 flew on mission STS-114 'Return to Flight' and ESP-3 on mission STS-118. The first of the external stowage platforms, called ESP-1, was installed on the port side trunnion pin on the outer hull of the Destiny Laboratory Module on March 13, 2001 during the second EVA of the STS-102 Space Shuttle mission. It is powered by the Unity Module and has two attach points to store ORUs. ESP-1 was carried into orbit on the underside of an Integrated Cargo Carrier. It is smaller than the other ESPs and ELCs, with dimensions approximately 0.46 m wide by 2.4 m long, and is differently shaped. FRAM-3 (top side) CTC-3 container moved here via SPDM. DCSU added by STS-123 crew) had been relocated via SPDM Jan. 30, 2013 to ELC-2. FRAM-4 (top side) Latching End Effector Support Equipment moved here via SPDM from ELC1. )Main Bus Switching Unit (MBSU) launched on ESP-2 moved to truss to replace a degraded unit which was brought inside and returned to earth on SpaceX CRS-12. FRAM-6 (keel side) Main Bus Switching Unit (MBSU) added by STS-120 crew This unit was swapped with a failed unit MBSU #1 from the SO truss, by the Exp 32 crew in late 2012. Video Stanchion Support Assembly (VSSA) launched on ESP-2 at FRAM-2 was jettisoned overboard on July 23, 2007 (the video stanchions were placed on the truss during EVAs). Pump Module (PM) (SN0004), initially installed on FRAM-1 during STS-121, was removed on August 17, 2010 by the Exp 24 crew and installed on S1 Truss, replacing the original (failed) PM SN0002. The failed unit had been temporarily stored on an ORU site on the MBS, then moved to ESP-2 by the STS-133 crew, then returned to earth by the STS-135 crew July 13, 2011. A failed Control Moment Gyroscope was installed on FRAM-5 from August 13, 2007 during STS-118 until February 13, 2008 when it was returned by STS-122. MBSU was moved to the truss during Expedition 52 and the Latching End Effector was moved to ESP2 to prepare for the spacewalk on January 23, 2018. The failed MBSU was returned to earth on Space X CRS12. ESP-3 was detached from its Keel Yoke Assembly (which remained in the Orbiter) and installed on the P3 Truss at UCCAS-1 on August 14, 2007 during the Space Shuttle STS-118 mission. It has seven attachment sites for ISS spare parts and assemblies, called Orbital Replacement Units (ORUs). The platform also has handrails and attachment points for tethers and foot restraints that astronauts can use while working with the ORUs on the ESP-3. ESP-3, as with ESP-2 are deployable versions of the Integrated Cargo Carrier and have the same dimensions, approximately 8.5 feet long and 14 feet wide. ESP-3 has two grapple fixtures to aid deployment. ESP-3 was the first major station element to be installed completely by robotics, using only the shuttle and station’s robotic arms, an external berthing camera system (BCS) and a Photovoltaic Radiator Grapple Fixture (PVRGF). Astronauts robotically installed the platform onto the station's P3 truss segment during the STS-118 mission’s seventh day. On January 12, 2010, the station's robotic arm was used again to move ESP-3 from the P3 truss segment UCCAS-1 site. It was grappled by the arm and then transferred down the station's backbone on the mobile transporter. ESP-3 was then attached to its new location on the lower part of S3 truss segment at the PAS-3 site. Moving the storage platform cleared the way for ExPRESS Logistics Carrier-3 to be installed during STS-134. FRAM-7 (keel side) ATA Flight Support Equipment (FSE) added by STS-118 crew. FRAM-2 originally hosted NTA tank (SN0005) that was launched on ESP-3, it was swapped for the depleted NTA (SN0002) from the S1 truss during STS-124. That failed unit was later returned on STS-126 when the FHRC was placed here. FRAM-3 hosted Pump Module (PM) SN0006 that was added by the STS-127 crew. The ISS Exp 38 crew swapped PM SN0006 with the failed PM SN0004 from the S1 Truss during 2 EVAs Dec. 21 and 24, 2013, leaving PM SN0004 on the MBS ORU POA for later storage. It was eventually (in Oct. 2014) stored on ESP-2 FRAM-1, rather than ESP-3 FRAM-3. FRAM-4 hosted a CMG & frame and both were removed Aug. 13, 2007 during STS-118. Support frame was placed on ESP-2, CMG was installed in the Z1. The failed CMG was placed on the CMG frame on ESP-2 FRAM-5 and later returned to earth by STS-124. ESP-3 being installed by Canadarm2. ^ "STS-102, Mission Control Center Status Report # 11 Tuesday, March 13, 2001 7:30 a.m. CST". Spaceflight.nasa.gov. 2001-03-13. Retrieved 2013-03-27. ^ "Minutes for May 29, 2001 EVA AIT" (Press release). NASA. May 29, 2001. Retrieved 2007-08-01. ^ "NASA ISS Assembly". Nasa.gov. 2010-10-23. Retrieved 2013-03-27. ^ "ISS Daily Summary Report – 03/06/15". ISS On-Orbit Status Report. Retrieved 30 March 2018. ^ a b c "EVA Checklist: STS-123 Flight Supplement" (PDF). ^ a b c d "EVA Checklist: STS-114 Flight Supplement" (PDF). ^ a b c d e "STS-118 Presskit" (PDF). 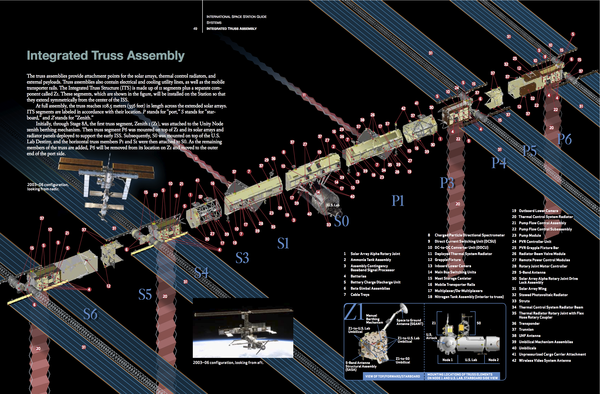 ^ "NASA's ISS assembly information". Spaceflight.nasa.gov. 2012-11-19. Retrieved 2013-03-27. ^ a b "EVA Checklist: STS-126 Flight Supplement" (PDF). ^ a b c "EVA Checklist: STS-127 Flight Supplement" (PDF). This page was last edited on 13 January 2019, at 15:48 (UTC).